Are you curios to know how we cut steel pendents in stainless steel jewelry production? Is there any alternative ? what are the advantages using wire cut in Stainless steel jewelry production? How it effect the price and delivery time? Read about one of the most used fabrication methods in stainless steel jewelry production. The wire-cut EDM is electrical discharge machine that uses CNC controller and continuous-traveling vertical wire under tension as one of the electrode to produce the desired shape. The wire in wire-cut EDM is about as thick as a small diameter needle which allows creating a very delicate parts or shapes. In the stainless steel jewelry industry this fabrication method mostly used to cut flat parts out of steel sheets i.e. dog tag pendants. Wire cut in stainless steel jewelry production considered to be a slow fabrication methods. As the industry advanced and if the thickens of the steel jewelry product we produce allowed. 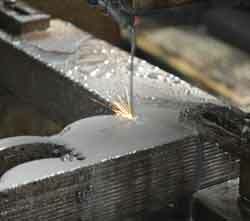 We prefer to use laser or plasma cutting. Which speed the process. Another disadvantage of wire cut is the finish of the part edges. in most cases it will require longer and costly polish process. Wire-cut EDM machining also known as Electrical Discharge Machining is an electro thermal production process in which a thin single-strand metal wire in conjunction with de-ionized water (used to conduct electricity) allows the wire to cut through metal by the use of heat from electrical sparks. Due to the inherent properties of the process, Wire-cut EDM can easily cut complex parts and precision components out of hard conductive materials. Wire-cut EDM machining also known as spark EDM works by creating an electrical discharge between the wire or electrode, & the work piece. As the spark jumps across the gap, material is removed from both the work piece & the electrode. This entry was posted in Fabrication methods and tagged stainless steel jewelry, steel jewelry factory, steel jewelry manufacturer on May 8, 2014 by Hulpf Team. spannendes Thema, zu dem ich gern noch mehr lesen würde. Beabsichtigst du weitere Beiträge zu diesem Thema zu verfassen? Freundliche Grüße aus Achern – Laureen!